Educated initially in archaeology and geology I have come to focus on the Holocene palaeoecology of invertebrates and human impacts on Indo-Pacific ecosystems. I am especially interested in how we can use the palaeo-archive of island histories to reconstruct prehuman island diversity and the changes that took place when humans colonised oceanic islands. Additionally, I have a interest in Australian invertebrate ecology and biogeography, especially in relation to Australia's largely endemic beetle fauna. 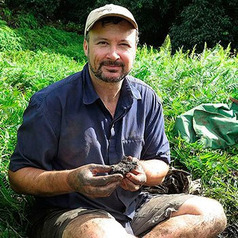 At present I am studying the recent fossil record (the last several thousand years) to characterise the nature and extent of human impacts on the ecosystems of Indo-Pacific islands. My research focusses and the role of human colonistation in driving species extinctions and invasions and changes in the nature of the ecosystems more generally. I'm interested in how the fossil record can contribute to island ecology, biogeography and evolution by providing novel insights that are only available through the prism of the fossil record.